In the past I have conducted studio sessions with various motorbikes (Yamaha FZ6 Fazer, BMW R 1200 GS, Suzuki GSX-R 750). I wanted to take more of such images and scheduled another shoot. Finding bikes was easy – I posted in a local Facebook motorbike group some images and asked, who wanted his bike photographed. The response was overwhelming. I selected four bikes, set up the studio under our carport again and off we went. I photographed five bikes that day, each one will be presented in an individual post. 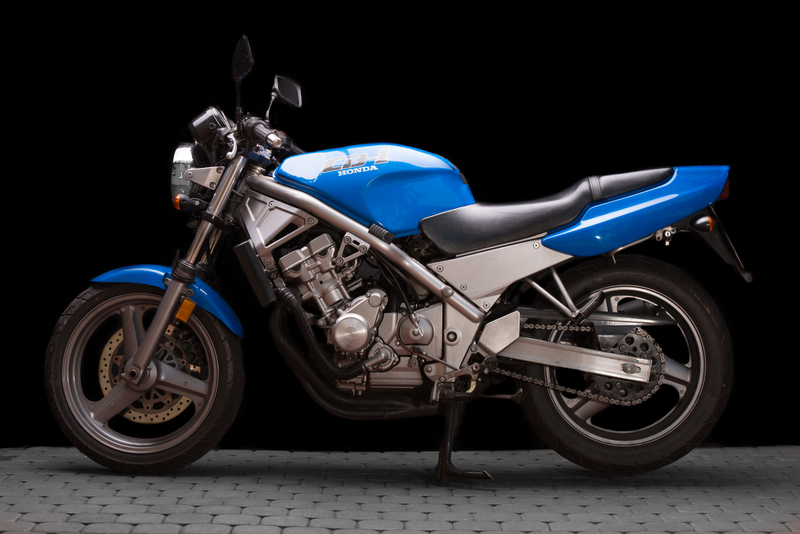 The first one is a 26 year-old Honda CB1 400. It is owned by Helge, one of the riders I met via Facebook. Albeit the bike’s age the design is still appealing, it does not look “oldtimerish”. 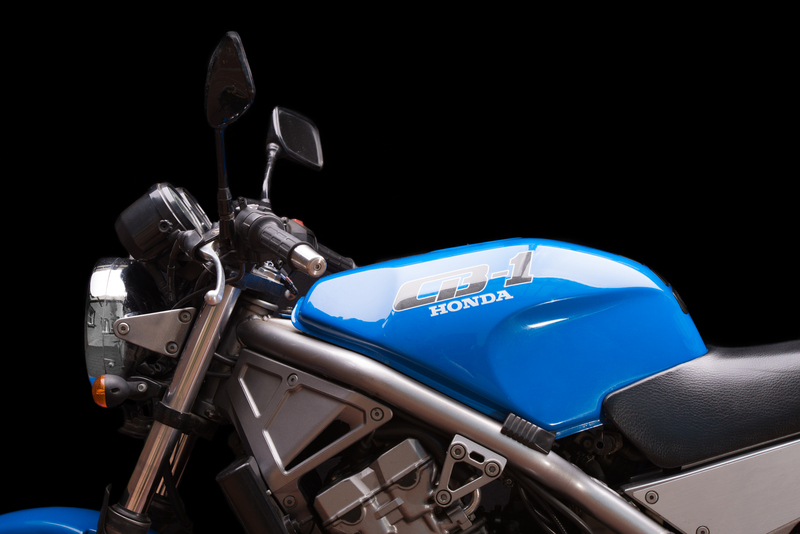 It has a 400 cc 4-cylinder engine which delivers 58 horsepower, the top speed is around 180 kph. 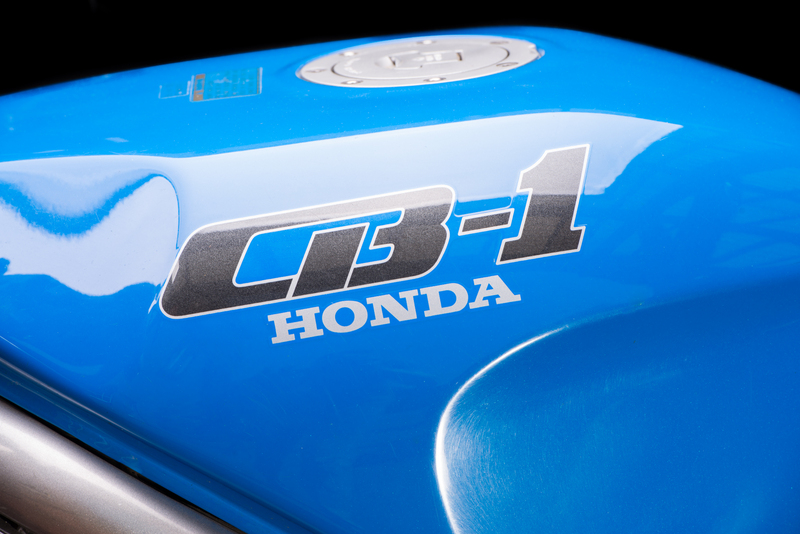 The CB1 was built between 1989 and 199 and was intended for the Japanese and American market, but somehow a number of bikes made it to Europe. I used the same studio setup like before – the studio flashes with the 80×120 cm softboxes were tied to the roof beams of our carport, a background system with a black backdrop set the stage. It was a sunny and bright day and the studio flashes had to fire at a full 600 Ws to fight down the daylight. 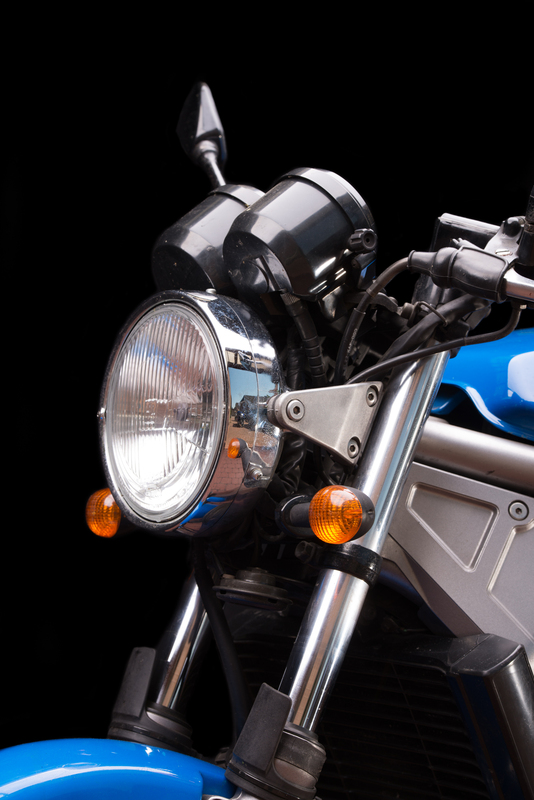 A third flash (to the left of the bike on the tripod) was used to light up the front side part of the bike. I could have used another flash lighten up the back side part, but I ran out of wireless triggers, so I had to work with just one flash (after the shoot I purchased another pair). 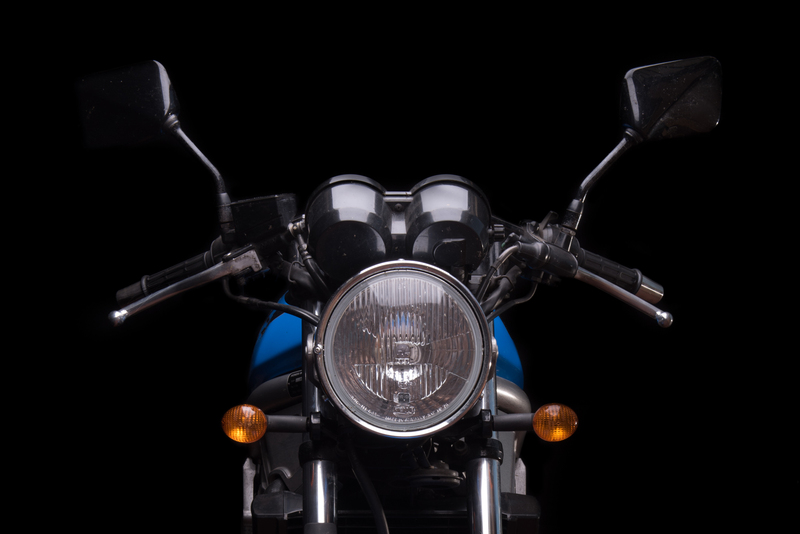 My routine for photographing a bike in the studio starts with getting a full shot of the bike (first image in this post). Then I move in a little and take detail shots of the bike. Fuel tank, dashboard, engine, whatever looks good on the particular bike. 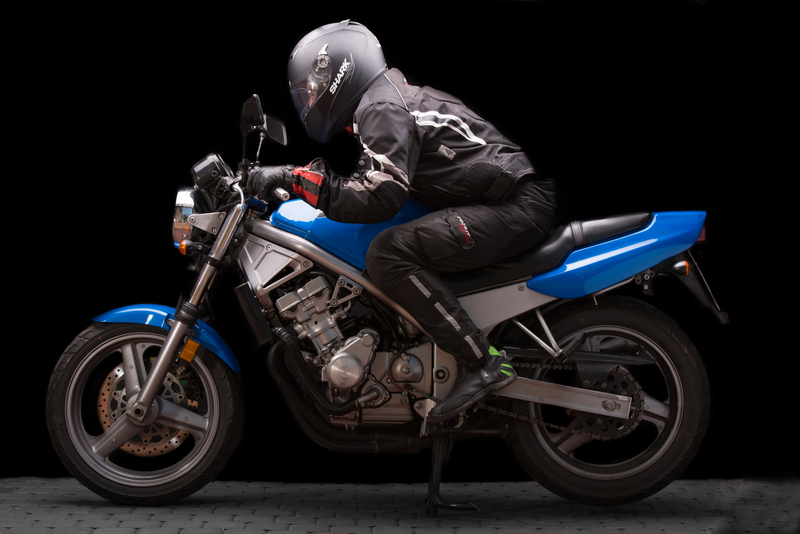 The rider is held responsible for moving the bike into the desired angle. For the shot above e.g. 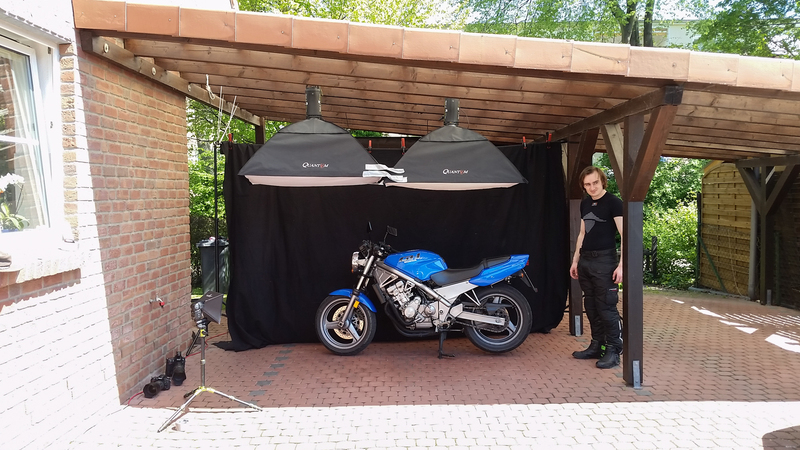 the bike had to be turned by 90 deg to face the camera with the backdrop system in the background. As I wanted not only to recreate past shots but add something new, I asked the Helge for a portrait with his bike. Usually I would have the rider standing for that, but due to spacial restrictions (see making-of image above, the flashes are hanging quite low) he had to sit in front of his bike. 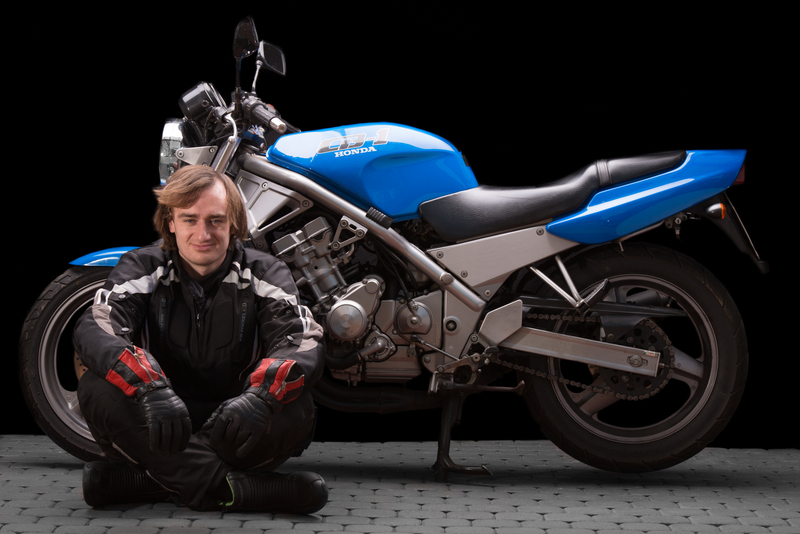 As a final shot I asked Helge to gear up and sit on his bike as if he would ride it on the road. Ok, usually he would not constantly bend as low as seen on the last image, but the low-hanging softboxes again prevented a more upright position. Editing was a nightmare. It was a windy day and the backdrop acted as a giant sail, constantly moving back and forth. 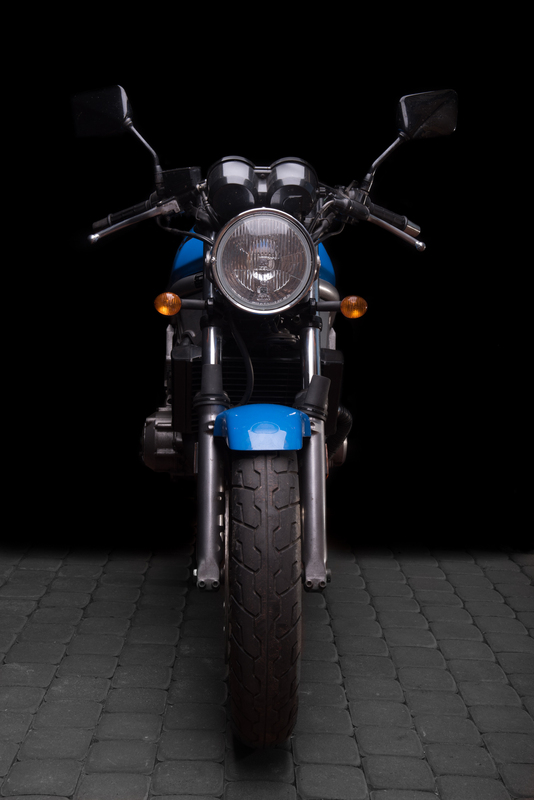 There was not much space between the backdrop and the bike, so the backdrop got a good portion of the light emerging from the softboxes. And that meant, that I had to paint the background black. Tedious, time-consuming work. And Lightroom is not made for such extensive image modifications. I used the brush tool with exposure and black set to -100. What you do is paint a mask over the image. And as the mask gets bigger and bigger, Lightroom starts to lag. At the end of the editing process I had a 3-4 second lag between the stroke of the brush and the result. That is why I moved to Photoshop in further images. Great bike, great photoshoot, great work, well done…!! !